Perdue's Chickens: Could Their Lives Be Made Less Miserable? Since the standard practice of dragging fully conscious birds upside down through cold, salted electrified water, to paralyze their muscles for easier feather removal after they are dead, is about as cruel as you can be to a sentient creature, subjecting them to a mixture of gases before slaughtering them would be, one hopes, less agonizing, but the procedure is complicated by many variables and has nothing to do with “putting the chickens to sleep” before killing them. 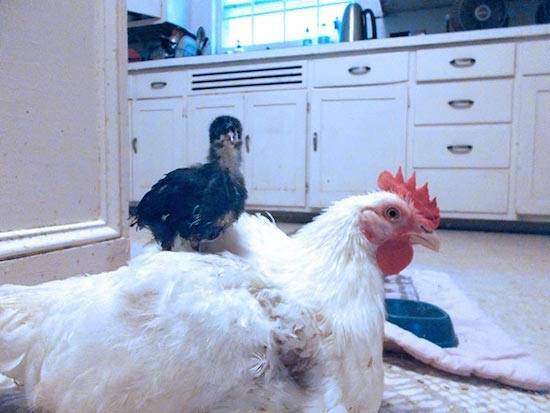 I would not begrudge any action that would make the chickens’ lives less miserable. If we think that a chicken house with windows and sunlight means little compared to one without windows and sunlight, let us ask which version of imprisonment we would prefer. Likewise, the ability to move. 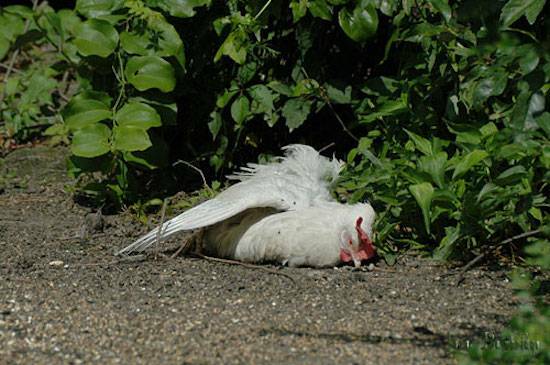 Like all chickens bred for the meat industry, Perdue’s chickens cannot stand up or walk properly. They have arthritic pain in their joints. They are slaughtered at six weeks old although a chicken’s skeleton is not fully developed even by 10 weeks of age. At six weeks old, only 85 percent of the chick’s skeletal frame has been formed, yet the skeletal frame is forced to support many times the weight and growth rate of a normal chicken. The lack of natural sunlight in the chicken houses adds to why Perdue’s chickens are so painfully crippled. With no natural sunlight or exercise, their joints are too soft to carry their weight. Having evolved in the tropical forest with full-color vision, chickens crave natural sunlight. On a summer day at our sanctuary, you will see them lying on the ground, often in little groups of three or four, with their wings fanned out and their feathers raised up to allow the warm sunlight into their skin. On winter days, our chickens follow the sun around the yard, eager to absorb the sun’s blissful rays. So replacing the dark windowless interiors of the densely populated and polluted chicken houses with windows that allow natural sunlight in would be a mercy, however motivated by a profit-driven company. Adding straw bales, perches, and a little more space between each bird, as Perdue says the company is considering, could also benefit the birds, potentially increasing their ability to exercise and thus to enjoy life a little. Most incarcerated people agree that small mercies are important compared to none at all. Still, it is hard to imagine how the amenities Perdue proposes would be implemented on the grand scale. Perdue Farms, which slaughtered 676 million chickens in 2015, has over 4,000 chicken houses on the Eastern Shore and elsewhere in the southern United States. 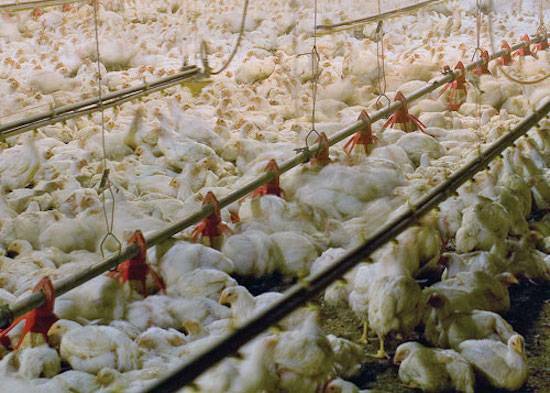 Each long low, featureless building has about 30,000 baby chicks inside. They are not kept in cages, but on floors saturated with feces and decaying wood shavings stretching farther than the eye can see through the haze of palpable air pollution. Ventilating these buildings with their thousands of occupants living at floor level, where the air quality is the worst, has always been a problem for the chicken industry. In addition, the chicken houses get what a Perdue contract grower called a “total crustout” – waste removal down to the floor – only every two or three years. Three houses alone fill 35 tractor trailers with a million and a half pounds of waste. So I wonder if adding an unspecified number of straw or hay bales in each house would worsen the air quality and the waste load. Living on the Eastern Shore of the United States, where Perdue chicken houses are everywhere, along with those of Tyson and the other chicken companies that dominate the region, I’ll be on the lookout for chicken houses retrofitted with windows, or new houses with windows, which probably won’t happen in my lifetime, if ever. Many more questions may be asked about Perdue’s proclaimed plans, including possibly raising slower growing birds with less grotesque breast sizes. Here, where change is so desperately needed, Perdue is noncommittal. The forced rapid growth of chickens for breast muscle tissue has produced a new pathology, called “woody breast” or “wooden breast.” I first heard of wooden breast from Tom Horton, who teaches Environmental Science at Salisbury University, in Salisbury, Maryland where Perdue Farms is headquartered, during a visit with his students to our sanctuary in Virginia in June. I looked up wooden breast online and learned that the industry has bred birds who are so biologically impaired that their breasts can develop a hard, wooden-like texture. Wooden breast in chickens involves necrosis, fibrosis and macrophage infiltration relating to the cardiopulmonary system’s inability to supply capillary blood to the bird’s massively growing breast muscle, which hardens as a result, and dies. “Also, Perdue will put its chickens to sleep before slaughter, a step taken several years ago by Bell & Evans, a smaller poultry company.” – Stephanie Strom, “Perdue Aims to Make Chickens Happier and More Comfortable,” The New York Times, June 26, 2016. Not only did The New York Times talk this way; The Washington Post uses the same image of gassing the chickens “to sleep” in a June 26th editorial praising Perdue’s consideration of replacing the company’s pre-slaughter electrical shock system with a system of gassing the birds before cutting their throats. The only ones who are put to sleep are those who dream that if The New York Times and The Washington Post say so, it must be true. But it is not true, not even close.